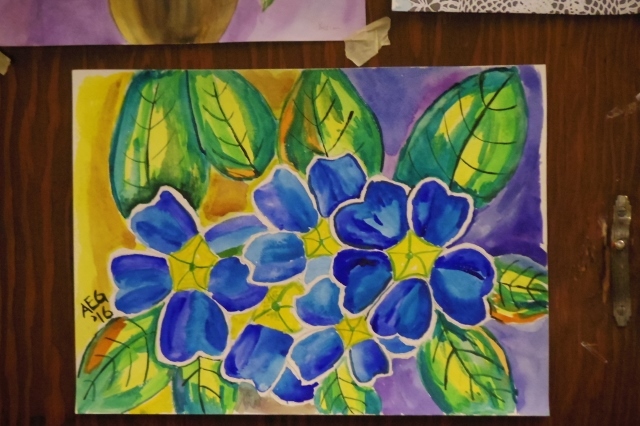 Today, I went to Stella Niagara for a painting class. 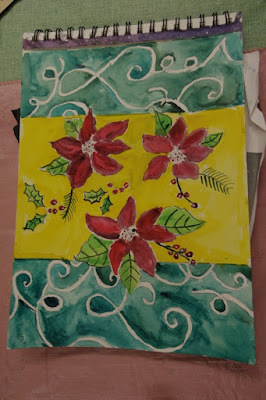 The theme was poinsettia plants. 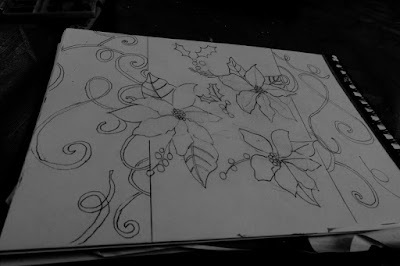 I had several references to work from so that I could see the size and shape of poinsettia leaves. I started by sketching several circles very lightly, and then I drew the basic shape of the flower. The circle keeps all of the petals (which are actually leaves) looking as though they are a similar size. I completed my drawing, with poinsettias in the middle and design elements on the top and the bottom. Today, the style that I was going for was illustration. I was looking to create a design, rather than a realistic image of a flower. I decided to paint the background first. 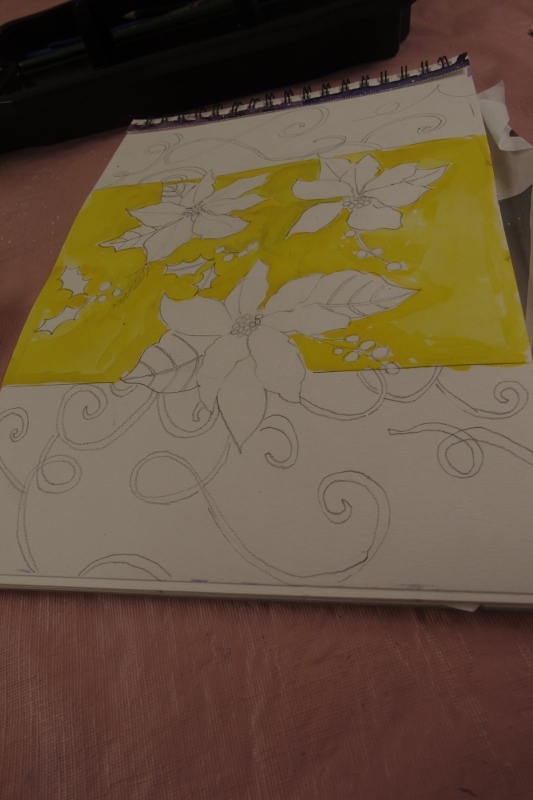 I chose yellow as the background for the middle section. For the top and bottom segments, I chose virdinian, which is a transparent emerald green color. 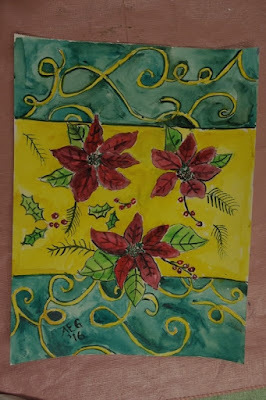 I painted the leaves and the poinsettias and the holly leaves and the pine branches. I used a light green for the leaves and two shades of red for the petals (carmine and alizaron crimson). Here is the completed painting, my interpretation of the poinsettia theme. My email crochet group just recently had a "mystery exchange." We signed up for the exchange, not knowing what the theme was. After signups were closed, the theme was identified. It was... recipe boxes. We could use any medium that we liked to create our recipe boxes. 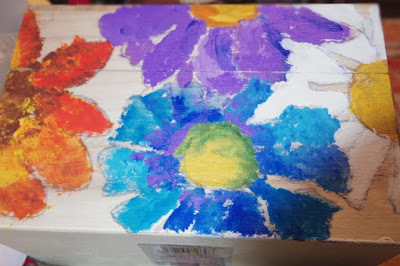 I chose to paint a wooden recipe box. 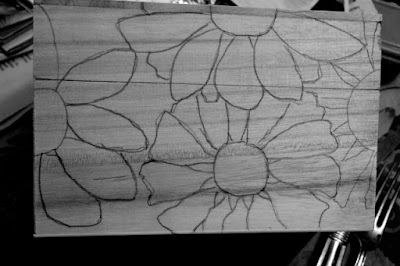 My first step was to draw my floral design on the top and all of the sides. There it is. 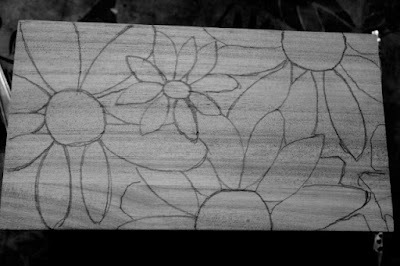 The drawing on the wooden box. I painted one side at a time, using acrylic paints. Here is the top as a work in progress. 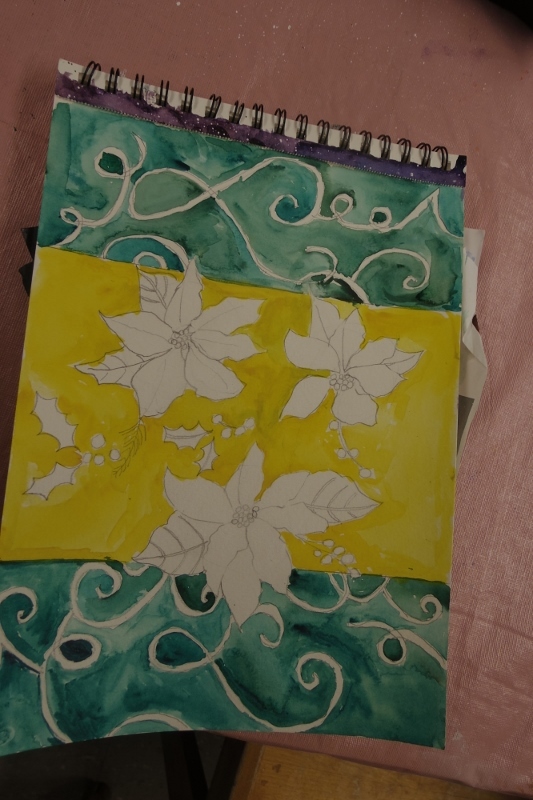 I let the paint dry and I go back and add more definition, with both acrylic paint and India ink. 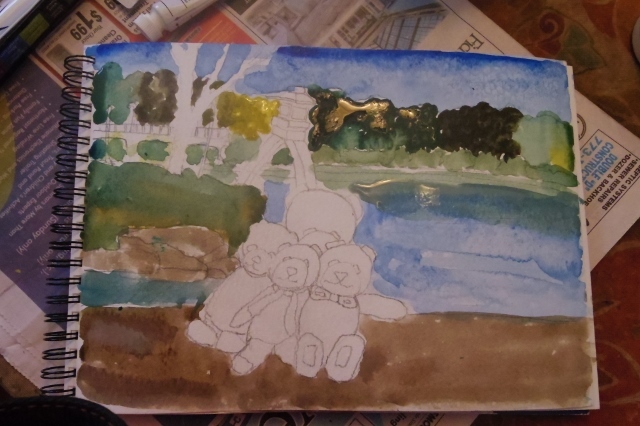 This is the underpainting for another side. 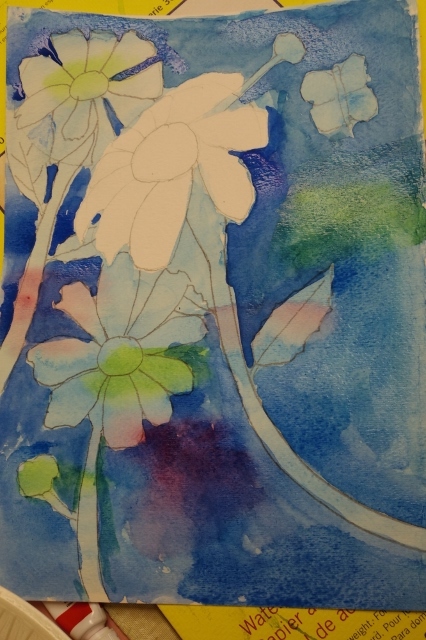 I defined the edges and added details to the center of the flowers. I chose to use mint green for the background because it felt springy to me. 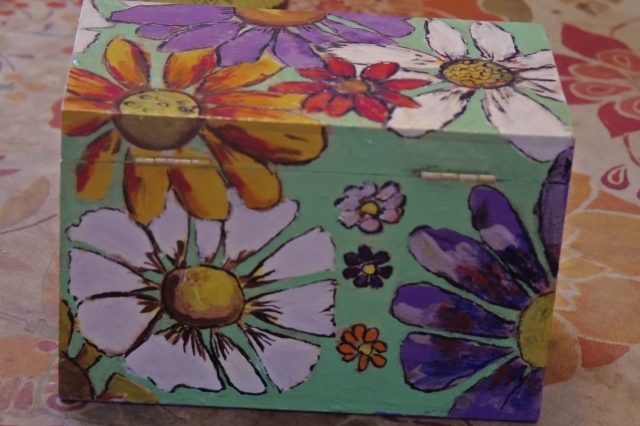 I felt that I (and the person who was going to get this box) needed to have something that said that winter was not going to last forever. 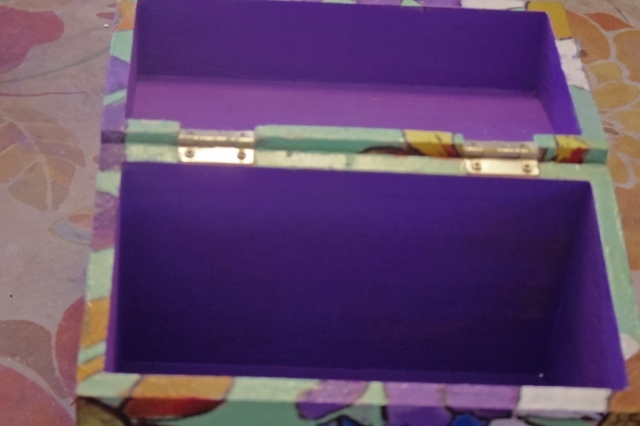 Here is a side view of the completed recipe box. 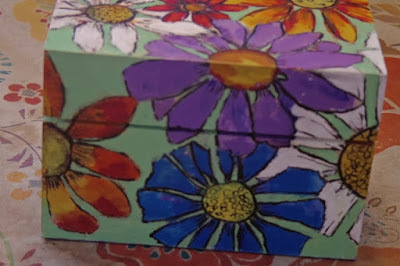 After I painted the box, I sprayed it (inside and out) with a fixative to prevent the colors from running in case the box get wet. 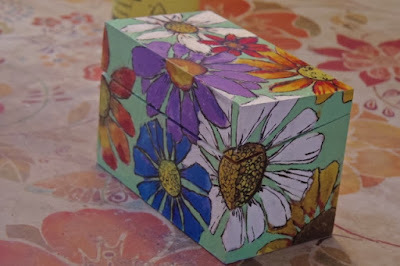 I am really happy with this box and have had a request for another box. 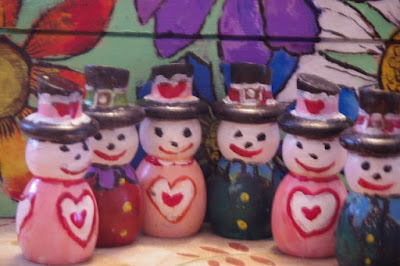 In the future, selling these at craft shows, along with greeting cards and painted bottles, could be an option for me. I chose to paint the inside of the box with a solid color. There was plenty of purple in the flower so I decided to continue with the purple theme. A group of Snow Humans pose with the box. I sent one of the Valentines snow humans to my exchange partner. Also, the last part of the exchange was to include at least one recipe with the box. I sent two: applesauce and pear-applesauce. Doing a mystery exchange is a lot of fun. I get to use my imagination and come up with something that I never anticipated doing. Also, when I was recovering from the flu and was not able to go outside (it was far too cold), I had something to keep me busy and happy. All in all, a win-win situation. 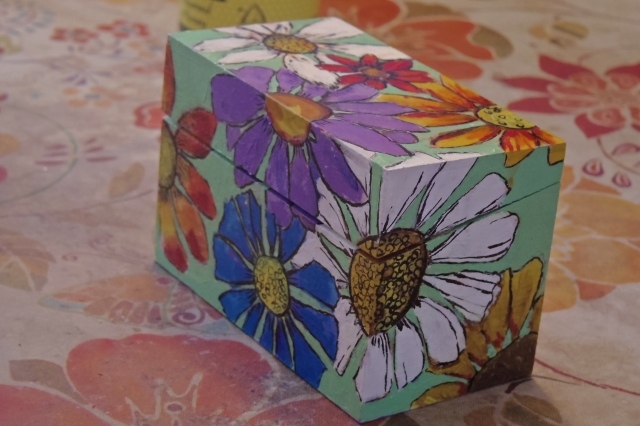 What creative projects have you been doing lately? Today, I went to the painting class at Stella Niagara, in Lewiston, New York. 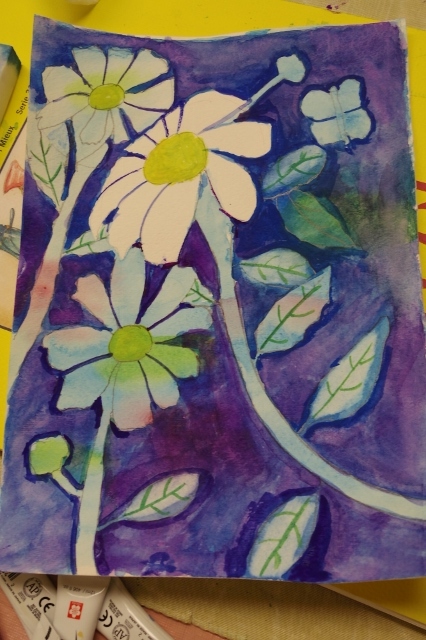 The theme of the class was posies. That immediately makes me remember my kindergarten days, when we played "ring around the rosie, a pocket full of posies..." and then fell down in a heap of giggling children. 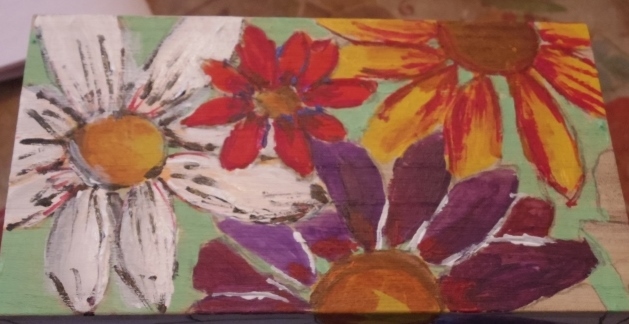 Today, we painted posies. They are small flowers that grow in groups and are surrounded by very large leaves that curl. 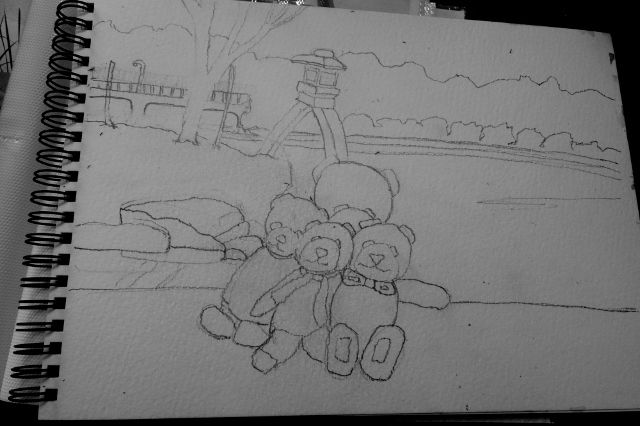 Above, you can see the drawing that I did on the watercolor paper. I tried to fill the page so I made the plants larger than life size. One of my most favorite artists in Georgia O'Keeffe, who painted extremely large flowers. Posies come in a variety of colors, including red, pink, orange, and blue. I chose to paint blue posies. 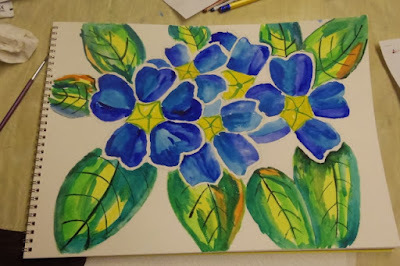 To add interest, as well as depth, to blue petals, I used three different shades of blue. 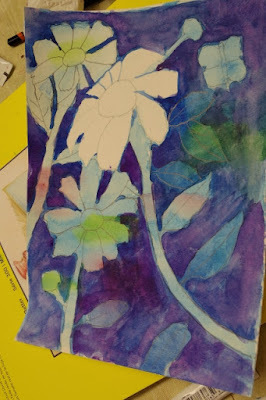 After I was finished with the petals, I began painting the leaves, using several colors. 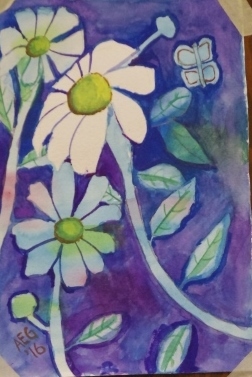 The center of the flowers is yellow and it has a star shape. 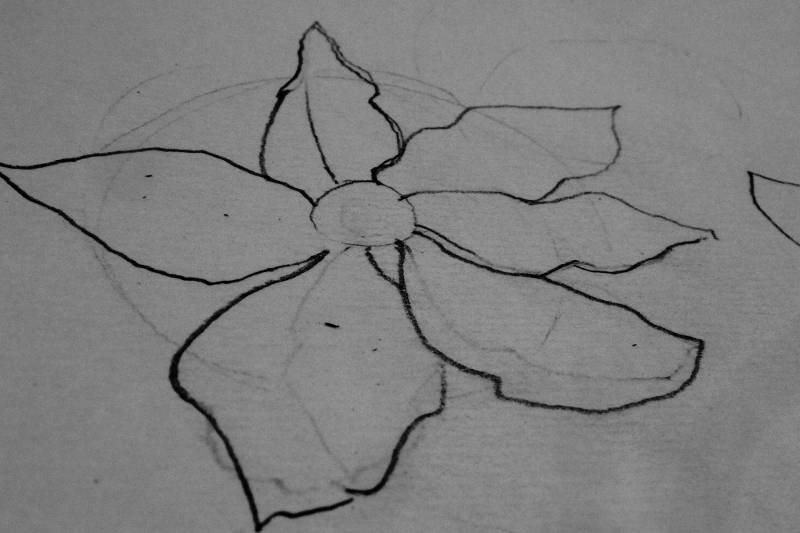 Also, I added detail to the leaves, including the pattern of veins. This is the completed painting. I chose yellow and purple for the background. Yellow and purple are complementary colors (opposites on the color wheel). Also, there is a great deal of yellow in the painting so the background colors bring out the flower. The last thing that I did was to sharpen the edges. So here you go. Flowers for a winter's day. 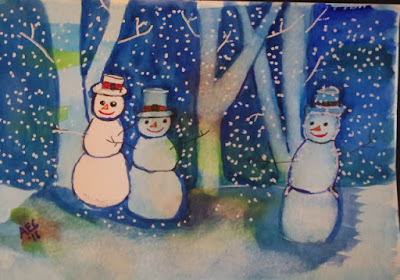 It's another cold, wintry day, a good day to stay inside and paint. I chose one of my photographs to use as a basis of a painting. 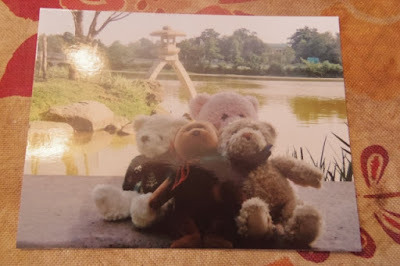 I had taken that photograph in August of 2014, when I went to a ceremony to remember the victims of the atomic bombings of Hiroshima and Nagasaki. I took the photograph at the Japanese gardens in Delaware Park in Buffalo, New York. The garden design is based on a garden design in Kanazawa, Japan, Buffalo's sister city. 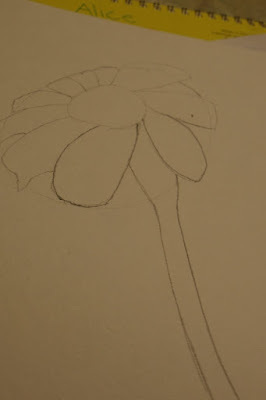 First, I started with a sketch (see above). My next step was to do the underpainting. 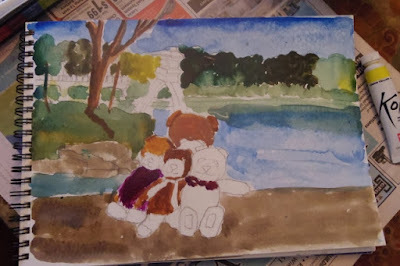 It is tempting to paint all of the background trees one shade of green but, in real life, trees are not that uniform. So I varied the colors of the trees, mixing together a very dark yellow (almost brown), yellow, red, and a few shades of green. 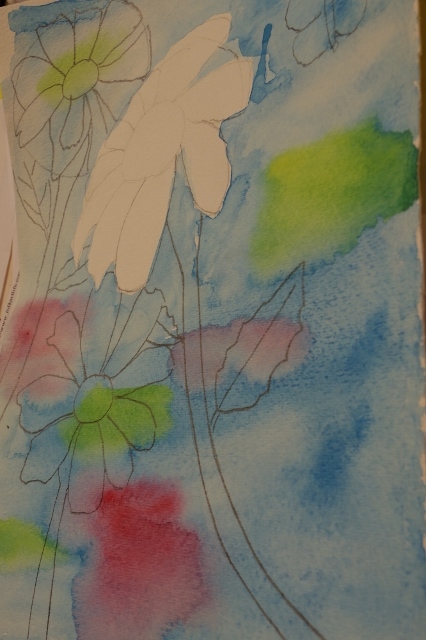 After letting the painting dry, I continue to add color. This is the finished version of the bears at the Japanese garden. It was fun for me to imagine a world full of color on a cold winter day. This is the photograph, which was taken in the summer. 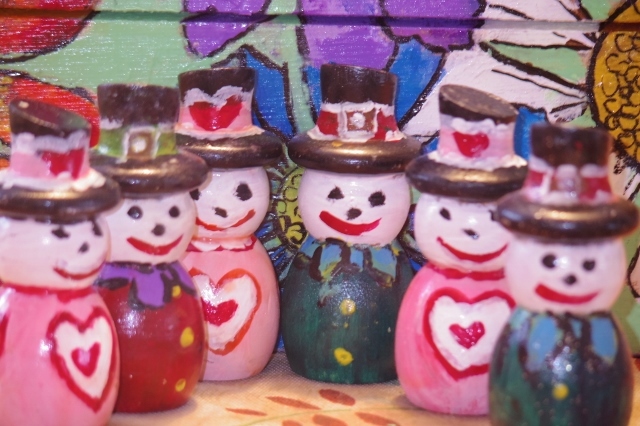 Question for discussion: What do you like to do to add color to your world during the winter? Yesterday, I went to Stella Niagara Educational Park for a painting class. 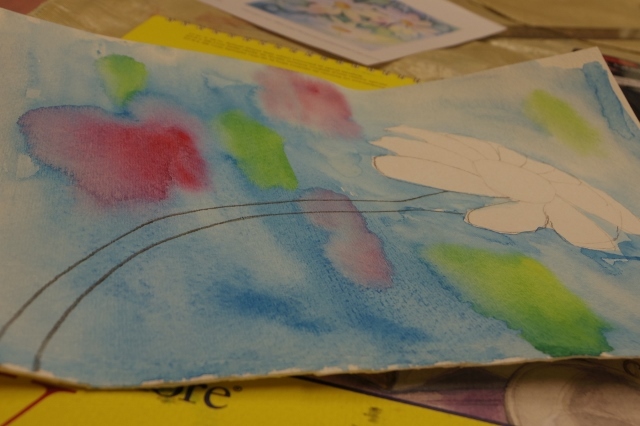 This time, the instructor, Virginia Kelley, offered a lesson on negative painting. 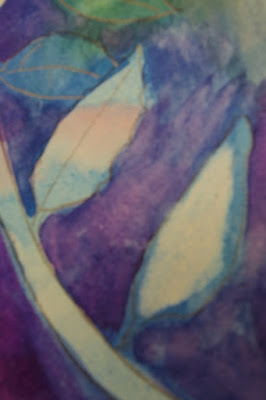 This is an exciting technique for watercolor painting that adds a great deal of depth to the painting. Instead of painting the objects, you are painting the space around the objects. 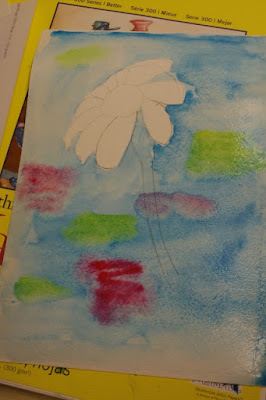 Virginia suggested that we make our paintings somewhat smaller than usual, so we each used a half-sheet of watercolor paper. Virginia took us through the process, step by step, which I really appreciated because I have difficulty remembering multi-step directions. The first thing that she had us do was to draw a picture of one daisy. Also, we needed to draw the stem. 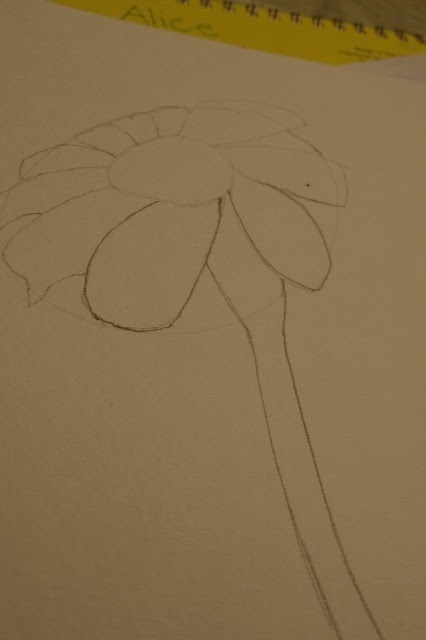 The stem comes from the center of the daisy, so if the daisy is off center, which is what Virginia suggested, the location of the daisy should indicate that. Having an off-center daisy is visually more appealing because it suggests movement. There is my daisy, above. 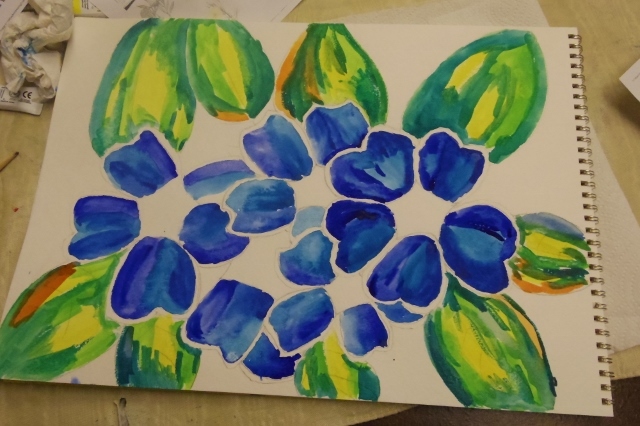 The next step is to make a blue wash. For this, you will put blue watercolor paint on whatever item you are using to mix paint. Add lots and lots of water to your paint because this wash should be light. Cover everything except the flower with the blue wash. You can cover the stem, too. After that, add some spots of color. Before you go on to the next step, your painting must be completely dry. One way to dry it is to use a blow dryer. After drying the painting, darken the lines that indicate a stem and extend the lines off the paper. 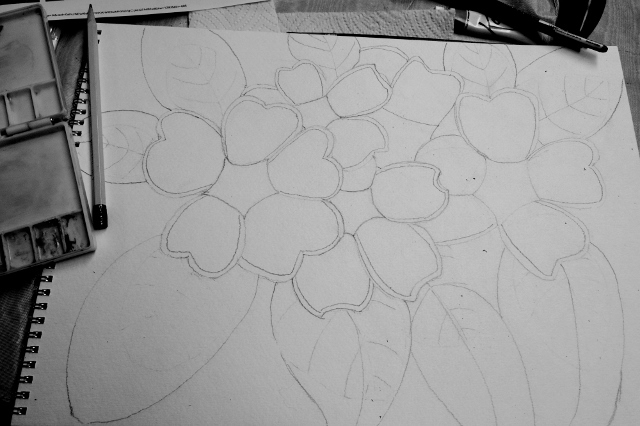 You will now draw in two more flowers and a few leaves. 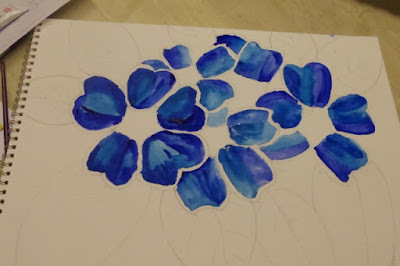 Mix a darker shade of blue and paint around the outlines of the flowers and the stems and the leaves. You have added your second wash. Once again, thoroughly dry the painting. Once the painting is dry, you could add a few more things: some flowers that have not opened yet and a butterfly or a bee. At this point, you could use a darker blue or a different color for a third wash. I chose purple. At this point, you may want to lighten some of the leaves. A magic eraser sponge does a great job in getting rid of excessive pigment on your painting. Now you're at the cleaning up stage. 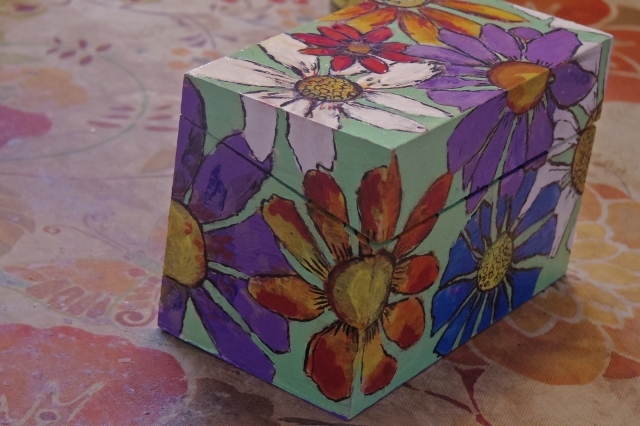 Paint around the edges of all of your objects: flowers leaves, stems, butterfly, etc., so that you can have crisp lines. 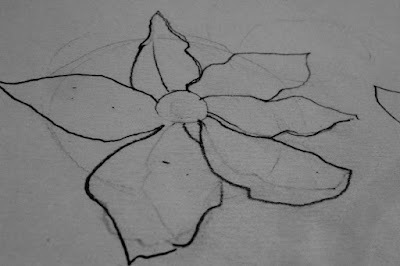 Add the veins to the leaves. To give more depth to the leaves, add some color, but not too much. Make sure to be gentle about adding color at this point. Also add some detail to the butterfly. One of the challenges of painting is knowing when to stop painting to prevent your creation from being overworked. This is a good place to stop. The only thing left to do is to sign your painting. You can photograph it and share the pictures with all of your friends. After a week or so, the painting will be thoroughly dry and the colors will shine even more than they do after your painting is just finished. Synopsis of Previous Bear stories: Bearnacle Bear took his ship to sea and was the unfortunate victim of a terrible storm. He was taken prisoner by the humans. Eventually, he escaped and was able to retrieve his ship and crew and return home. He had been away for so long that the crew, which found shelter on an island, had a whole collection of bear cubs. One of the bear cubs was Sweet Suzie Bear. Bearnacle Bear and his crew had been rescued by the Sea Monster and the Mermaid, who are usually quite elusive. The bears and the humans later became friends. Sweet Suzie Bear grew up and went to art school in the Land of the Humans and later became curator of the Bears Art Gallery. Her most recent exhibit was titled "Modern Art Bear." It received positive reviews in the publications of bears, humans, and giants alike. 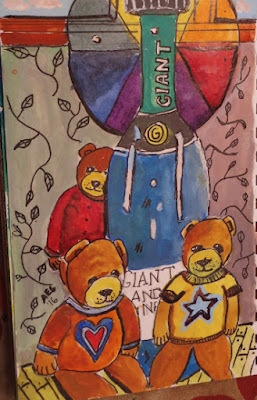 Later, Bearnacle Bear took a group, including Beartrand, the radio station bear, and Sweet Suzie Bear, to visit the Land of the Giants. Sweet Suzie Bear kept detailed journals and had a great time. Unfortunately, Beartrand Bear suffered from seasickness . I'm going to be a sailor, he wrote. Let's not and say we did, he added later. The bears are back at home and are ready to celebrate their trip to visit the Land of the Giants before hibernation. The bears are ready to celebrate their trip with wine that they brought back from the Land of the Giants. There is also sparkling grape juice and hot chocolate. 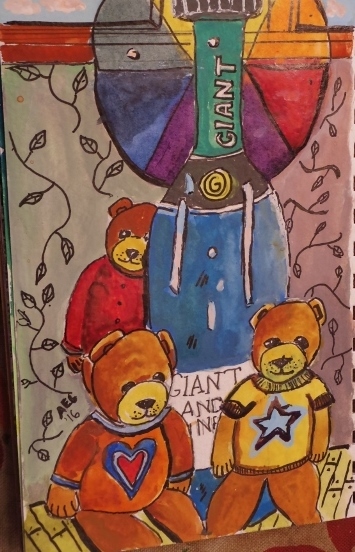 The wine was given to the bears by the giants and are in bottles that are giant-sized. 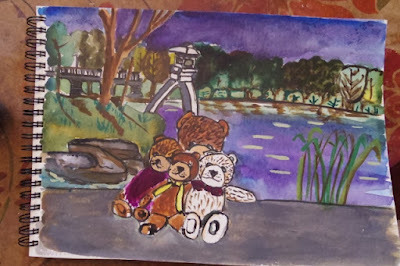 next bear story: Bearnacle Bear, Sweet Suzie Bear, and friends visit Mouse City.